Grab your kids, grab a few white shirts and have some Summer fun with this Bucket list of fun idea to Tie Dye using Kool Aid. No more need to buy fabric dyes with this idea to Tie Dye using Kool Aid we found over on Budget101.com. Step 1: Mix a solution of (2) unsweetened Kool Aid packets, 4 c. warm water & 1 c. White Vinegar in a container. 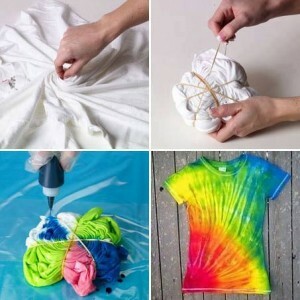 Step 2: Tie a rubber band around a section of the T-shirt and soak for several hours. The easiest way to do this is to take a plastic bread bag, shake out the crumbs, wrap the elastic tightly around the shirt, dip it into the colors you want, then stuff it into the bag, let it set 24 hours. Step 3: Wash and dry the shirt.